"The 1954 recording was in generally good condition, though with dreadful tonal balance... With this corrected, the restoration was straightforward and the results fine." Actually I'd go a step further - I think this recording has come out excellently and beyond the corrective equalisation from the XR process and the notching out of a couple of rogue tone frequencies, required remarkably little intervention. The sound is full-bodied and well recorded, and the performance, yet again from Cantelli, a real treat! Compared to his longer and closer relationships with the NBC Symphony and New York Philharmonic, Guido Cantelli’s work with the Boston Symphony Orchestra was limited to just six programs he led in Boston between January 1953 and December 1954 (plus occasional tour performances of a few of those programs in Providence, New London, New York, Washington, and Brooklyn). As a result, the Cantelli/BSO material that has circulated doesn’t consistently achieve the same level of incandescence typically audible in his work at NBC and with the Philharmonic. On the other hand, this did not keep one now-retired BSO percussionist from stating, decades after the fact, and with no hesitation whatsoever, that Cantelli was the greatest conductor he’d ever played under. 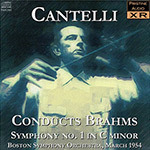 Among Pristine’s Cantelli releases are his 1949 American debut concert with the NBC Symphony (Pristine 84); a 1955 Barber Adagio for Strings with the New York Philharmonic (on Pristine 88) that invites comparison with Toscanini’s 1938 premiere of that work at NBC (on Pristine 80); and a Respighi Pines of Rome from the same 1955 Cantelli/NY Phil concert that invites comparison to Cantelli’s 1954 Pines with the BSO (issued by the BSO itself some years back, and, until Pristine’s release, the only extant example to that time of Cantelli leading the piece). What I’ve chosen to list here is another Cantelli performance that as far as I know has never had general circulation—a 1954 Brahms First with the BSO that’s one of the greatest performances of the piece I’ve ever encountered.